The healing protocol known as Nutritional Balancing is gaining popularity. When I first started the program almost a year ago, I had quite a bit of difficulty finding others who were on the program as well. In the past several months, I've noticed that Nutritional Balancing is appearing on blogs and sites with increasing frequency. Today, I want to introduce you to Nutritional Balancing (NB). If you experience unresolved or mysterious health issues that don't seem to improve with dietary changes alone, it may be time for something a little more intense. 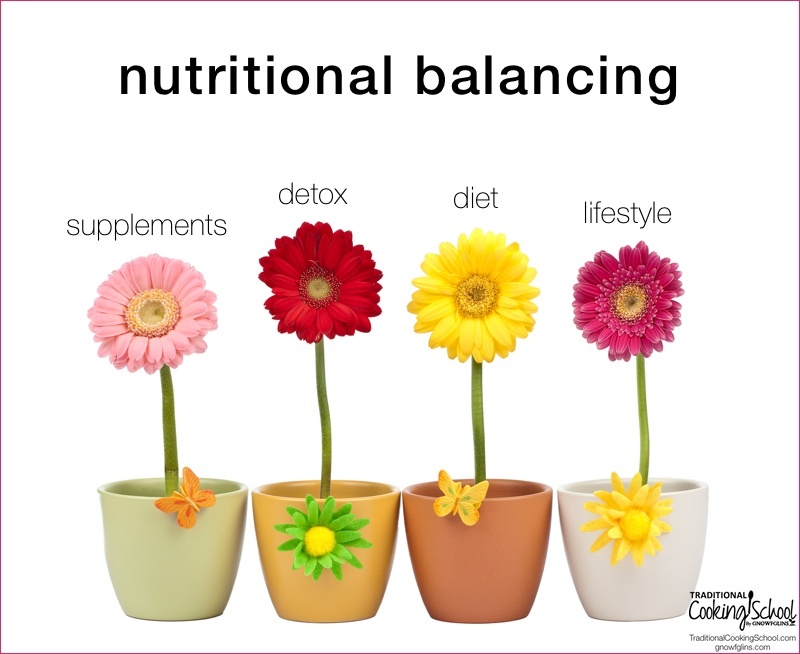 Nutritional balancing is a sophisticated, integrated system for healing the body at a very deep level. It uses older principles…, traditional naturopathy, and the use of specific foods and nutrients to increase the vitality level of the body. It also employs modern theories such as the stress theory of disease, metabolic typing, cybernetics, holography, fractal mathematics, chaos theory, biological transmutation of the elements, and other physics and engineering concepts. These are combined with up-to-date Western medical physiology and biochemistry. In layman's terms, NB is a healing approach that is scientifically based, not symptoms-based, and utilizes both old and new principles and sciences to correct nutrient deficiencies and heal metabolism, which in turn, heals the body, mind, and spirit. I completely believe in natural medicine and unconventional treatments. However, I've personally experienced that many of these modalities — such as chiropractic, NAET, applied kinesiology, and dietary (the GAPS diet) treatments — usually lack scientific testing to determine the exact imbalances, deficiencies, hormone levels, and other contributors to autoimmune and metabolic disease. I tried three chiropractors, two nutritionists, and one NAET-certified naturopath, and not one of them recommended or provided any type of blood, stool, urine, or hair testing to determine the root cause of my health issues. As my health worsened, I felt like the practitioners I trusted were merely “shooting in the dark” to figure out what was wrong with me. When I found a Nutritional Balancing practitioner, I was properly tested to know precisely what was going on in my body. This test, a simple and non-invasive hair test, is known as the hair mineral analysis. The foundation of any NB program is the hair tissue mineral analysis. From this test, a NB practitioner can determine exactly what the patient's mineral imbalances and deficiencies are, the patient's metabolic type, heavy metals that may be present or not eliminating properly, energy levels, stress patterns, autonomic nervous system assessment, thyroid and adrenal function, and more (source). The accuracy is estimated to be within 3%, which is very good. The hair is cut at the scalp, and approximately one inch of hair is needed from each cut. Hair is placed on a paper scale, weighed to get the correct amount needed for the test, and then sent to Analytical Research Labs in Phoenix, Arizona. Hair testing must be performed at this lab, as it is the only one that does not wash the hair prior to testing — unwashed hair is crucial to the accuracy of the test. Expect to pay between $100 and $200 for your hair analysis, depending on your practitioner. Results take about two weeks to get back from the lab to your practitioner. NB practitioners train with Dr. Lawrence Wilson, who often consults on each patient's test. My personal practitioner goes over all his patients' hair tests with Dr. Wilson before discussing results and recommendations with the patients. Once the results of the test are in, you will have scientific proof of what is occurring in your body and receive a four-pronged approach to treatment, specific to your results. Hair testing is repeated at three- to six-month intervals to monitor progress on the program and so your practitioner can make changes to your program as needed. It is essential to the success of the program to do these repeat hair tests. As detoxification and healing occur, heavy metal toxicity and mineral ratios will change and your specific program, especially supplementation, must change as well. Click here for more info on hair tissue mineral analysis and how it can help you heal. Although each patient's program will be specific to his or her test results, the approach is the same for everyone following a NB program. The four key elements of a good NB program are: supplementation, detoxification, diet, and lifestyle changes. Supplementation: High quality supplements are prescribed based upon the mineral deficiencies and imbalances that need to be corrected. Because of the mineral depletion of our soil, our food cannot supply all the necessary nutrients people need, especially if one has an autoimmune condition or metabolic disorder, both of which are becoming increasingly common. Add to this the toxicity of our environment, including exposure to xeno- and phytoestrogens, poor air quality, volatile organic compounds, and more. It's easy to see why our bodies struggle to maintain proper mineral balance. Several supplements are standard to the NB program: sea kelp, calcium, quality fish oil, and digestive aids such as betaine hydro-chloride and/or ox bile. After that, a specific supplement regimen is designed according to the individual's needs. My own supplement program involves zinc, selenium, a potent multivitamin, a thyroid supplement, and a kidney supplement, in addition to the standard NB supplements. Your supplement program will likely be different, as your hair test will certainly show different metabolic rate, imbalances, deficiencies, nervous system function, and thyroid and adrenal function. It is important to take only the supplements your NB practitioner prescribes for you. I was tempted in the beginning to add in a bunch of stuff because I was convinced that the supplements given to me weren't going to be enough. I trusted my practitioner's experience, however, and those supplements were enough. Of course, if you are taking prescription medications, it is vital that you work with your NB practitioner to determine if and when you can reduce or completely eliminate those medications. Detoxification: This is a key component of NB and should not be neglected. Coffee enemas and the use of a near-infrared sauna are required. Heavy metals are typically stored in the body's deep tissues, such as the brain, bone marrow, and liver, therefore deep detox methods must be used to rid the body of these harmful substances, which contribute to impaired hormone production and mineral deficiencies. It is also necessary to detoxify the body of any remnants of toxic prescription drugs, tobacco or recreational drugs, vaccine chemicals, and even chemicals from conventional dentistry procedures. Those of us with metabolic disease typically are more prone to be poor eliminators of these toxic substances. Our bodies, because of sympathetic-dominant nervous systems, low body temperature, impaired thyroid and/or adrenal function, and slow digestion, are prime spots for parasites, yeast overgrowth, and acute or recurring infections. The coffee enemas and sauna therapy really assist in the elimination of these harmful things and allow our bodies to heal more quickly and efficiently. Diet: A patient's diet is determined by their rate of oxidation (metabolism), which is either slow, fast, or mixed. The basic NB diet is high in certain cooked vegetables such as leafy greens, root vegetables, and cruciferous vegetables. Meals are based around cooked veggies; it is recommended to consume 8 to 9 cups of cooked vegetables per day. This is because vegetables are high in minerals and also very healing to the body. Good protein is also part of the program. Grass-fed beef, bison, and lamb, wild-caught sardines, and pastured poultry are staples. A small amount of raw milk daily is fine for those who tolerate it. Also, fresh carrot juice is an integral part of the diet. High quality sea salt is encouraged because of the high mineral content of the salt. Butter, raw cheese, and olive oil are encouraged sources of good fat. All sugar, including fruit, should be avoided. This is because simple carbohydrates can wreak havoc on blood sugar, which tends to be unstable in individuals who require this type of program. Low-glycemic berries may be eaten occasionally. Grains, including gluten-free grains, are also avoided most of the time. Nightshades, like eggplant, potatoes, and tomatoes, should not be eaten because they are very inflammatory. Table, or iodized, salt is full of aluminum and also not recommended. Dr. Wilson advises people to avoid shellfish and wild-caught fish like tuna and salmon because of mercury contamination. (I, personally, still eat salmon. I'm not convinced that mercury is as big of a problem as many make it out to be. You should decide for yourself.) Soy, legumes, most nuts and seeds, and all processed foods are avoided as well. In many ways with slight variations, NB resembles the Autoimmune Protocol. The dietary aspect of NB is another reason why you should work closely with a practitioner and not attempt to do a lesser version of the program on your own. There are several foods which Dr. Wilson says to avoid that my practitioner encourages me to eat regularly. Examples of these foods are coconut oil, sweet potatoes, and avocados. I tolerate these foods with no issues, and they have been very healing to me so far. I will note that simply following the NB eating plans probably won't be enough to produce noticeable healing results. The program is designed to include all of the four components, not just one or two. Lifestyle: All of the supplements, coffee enemas, and healthy food in the world won't do a person much good if they aren't able to get their stress levels under control. The role stress plays in the development of disease is astounding. Physical (overexertion, too much hard exercise) and emotional (childhood traumas, anxiety, financial) stress, racing thoughts, fear, and busyness contribute to wearing down our bodies, especially if we are not taking the time to prepare and eat nutrient-dense foods, release and forgive those who have hurt us, scale down our outside time commitments, or even transition out of a high-stress job to a more enjoyable one. As you can tell, Nutritional Balancing is a complex program that slowly and gently brings balance back to the body and allows it to heal from numerous conditions. Amazingly, people of all types can heal: children, pregnant or nursing women, the elderly, men, and women. In children, conditions such as ADHD, recurring runny noses, ear infections, or sore throats, allergies, and asthma have the potential to be reversed quickly through a NB program. Children usually respond to treatment more quickly than adults, require fewer supplements, and can reach stages of development that may have been delayed before if poor nutrition or mineral imbalances were the cause of delay (source). If you are experiencing a health condition that doesn't seem to improve no matter what you try, I encourage you to contact a NB practitioner and have a hair mineral analysis done. This science-based program is safe, effective, and totally holistic since it is designed to deeply heal mind, body, and spirit. Have you ever heard of Nutritional Balancing? Are any of you currently working with a practitioner on your own NB program? Please share your experiences, comments, and questions below! I have heard of NB but didn’t know very much about it, so thank you for this helpful article! One thing to consider with most of the health conditions you listed at the bottom of the article is that Low-Dose Allergy shots (LDA) will treat those conditions as well. I know multiple friends and relatives, including myself, who are using LDA shots to treat food allergies and other symptoms like Lyme Disease, arthritis, asthma, and more. The use of LDA for many types of health problems is growing like wildfire, and I’m living proof that it is working well! There aren’t a lot of doctors or practitioners who use LDA yet; there’s an outdated list at Dr. Shrader’s website of doctors and naturopaths, etc. who are authorized and trained to use LDA. Thankfully, my naturopathic physician lives about an hour away, so I will see him every 7 weeks for about a year to 18 months, and then probably will only need one shot every year or every 3-5 years. It sounds like NB is also a great option! There is a new Facebook page for Low Dose Allergy shots, and it’s quite informative. Thank you, Lindsey, for the thorough description of NB. I’ve been doing it for over 5 years now, and it is making all the difference in the world in my health. Unfortunately, lots of things have needed addressing so it’s a journey that is taking me a while. But I do see important changes all around. While I don’t want to “water down” the program, I know all the elements can be overwhelming to “newbies” or those considering NB. So I would add that you don’t have to embrace all aspects of it the minute you begin. I believe changing your diet, taking the prescribed supplements (and no others), and working on getting more rest are the crucial first steps. Even the dietary changes (especially the 9 cups of vegetables) can seem huge at first. Plan to work up to that goal, and, even then, don’t beat yourself up if you can’t do it daily. Many people come to NB like me, exhausted, and some of this just sounds “undo-able” at first. The detox procedures are really helpful, and I suggest adding coffee enemas as soon as possible. The in-home sauna can seem like another massive effort, money-wise and energy-wise. An alternate method, although not as powerful, is to shine a single red-bulb on your belly/liver area for up to an hour a day. Dr. Wilson’s site, http://www.drlwilson.com, describes this. It doesn’t cost much and can be clamped to the headboard of your bed or to a portable dryer rack, which is what I did. I believe using this almost daily for almost 1 year helped my liver tremendously. It was after I began this that I saw liver/gallbladder stones come out during my coffee enemas. I recently cleaned out a walk-in closet in a spare bedroom and installed a sauna. I’ve been using it daily for over 3 weeks now and am happy at how much I am sweating. Many of us in poor health hardly sweat at all, and I think having been on the program for a while and using the single-red bulb made a big difference. If any of you reading this decide to do NB and use a practitioner trained by Dr. Wilson (which I highly recommend), please join the FB group listed on his site. I learn a lot from those like-minded folks! And their dedication inspires me. Hope my thoughts are helpful. Thank you, Diane! I’m on the second month and still haven’t incorporated the totality of the protocol. Your kind encouragement is perfectly timed for me to read. This isn’t easy, but having your wisdom available sure helps. what is the facebook page for this protocol? This is probably the best place to start. http://www.arltma.com/ Also, google Nutritional Balancing. I started by reading the reviews on one of the areas I stumbled upon. I was about to go down the road with MTHFR treatment. So glad I didn’t. This has been around much longer and, in my opinion, is a better way to bring the body into balancing, hopefully turning off the mutations as we balance and heal. We use a naturopath in Rockwall, TX at Get Healthy Rockwall. Hi Diane, I am new to NB and this is really helpful. I have just sent off for my first hair analysis. Where can I meet others on NB? the FB groups do not exist any more, I’d love more ideas and input. I also do the heat lamp therapy and it has been amazing. More improvement with this than with anything else. Do you know if insurance will cover the cost of the Hair Analysis Test? I also read some of Dr. Wilson’s writings on spiritual development and as a Christian, they just don’t jive with me. I would like to know a bit more deeply how you resolved this in your mind and practically. The science is sound. It saved my daughter’s life. Huge answered prayer. Ignore his theology. Thank you for the great article, Lindsey. I imagine you are the perfect person to ask the question I have had…have you seen any sample menu plans or recipes one can use on the diet? Or have you created any yourself that you can share? The diet can seem intimidating, so to see it fleshed out into what one might eat over the course of a week would be really helpful. Thanks for any tips you can share! I’m a newbie to Natural Balancing after trying so many other protocols. This one is my “it.” Why? Because the science jives with what I’ve touched upon in many different disciplines. This program brings it together for me. The most exciting thing is watching my eyes change (I’m a student of iridology). I’ve never seen the eyes’ map change so quickly. . .from the autonomic nerve sheath to the scurf ring, cramp rings and nerves. So, yes, the diet is limiting. . .and even though I’ve been so sick in the past as to require a liquid diet for 2 years, NB has been challenging. I’m not asking my family to journey with me, so I cook differently for others. I’ve cried in frustration. But I keep going because of the positive changes. I’m amazed at what my body choses as priority issues to tackle. The body runs the show, but I’d rather have clear skin than stronger finger nails. And I’d rather have improved digestion than the ability to sweat. But “they” say, the body knows best. So I wait. I’m streamlining everything so that I can fully immerse in this protocol; I can’t do it all at once. For instance, buying a juicer (for carrot juice) is out of the question; so it waits. And I have an emotional block for enemas—after years of high colonics, I feel like I’m going backwards into a horrible part of my life. I’m slowly working through the resistance. Ironically, just when I was getting good at sourdough baking, along comes NB. At least my family can enjoy! All my life I looked at vitamins, vitamins, vitamins as the key. It never was vitamins. The key to life is the dust of the earth that made our flesh –health is in the spark of minerals. Basically, that is what NB is all about. . .providing the right minerals, cleaning out the toxic ones, and getting your spark back! I hope the understanding of NB for all because it is rich in wisdom. Blessings! I’ve been listening to a NB practioner’s podcast for several months now. I find it fascinating. I can’t decide if I want to work with a NB practioner or a functional medicine doctor. I’m overall pretty healthy (or so I think) with the exception of a very annoying movement disorder called dystonia. I doubt it would help, but I know it wouldn’t hurt. My 3year old son is my biggest concern. He has horrible eczema, bowel issues, reoccurring runny noses, and he would probably win the prize for pickiest eater in the world. He is also a junk food junkie (not my doing AT ALL, but his grandparents and father give him dinner 4 days a week and despite my instructions give him crappy food). All he eats is bread, cheese and fruit so I’m not sure if this program would help. Any advice would be great! NB practitioner or functional med doctor? Nutritional Balancing is my “it.” I have certifications in many modalities, but when I read Dr. L. Wilson’s lifestyle applications of Dr. Eck’s amazing work. . .the wisdom blew my mind. I know this is really deep, but Dr. Eck’s persistence to understand a biological pattern led him to the understanding of human mineral mapping. . .yes, this man understood the code to the perfect and original mineral plan of all races, ages and genders of people. When I could see that, I knew I wanted to benefit from that kind of knowledge. I’m not playing games anymore. I’m 50 and time is short. I’m in the four-lows pattern, known as “the tunnel of death” in eastern medicine, I’m on a path to early death. The first half of my life has been lived subpar due to small and large health issues. There came a day seven months ago when I said, “My heritage was not sickness, but health; and any dis-ease is not what my perfect Creator designed for me.” That was the day I got serious and put my will down in favor of a better outcome. If you are not serious, you will know by simply going to Dr. L. Wilson’s pages (he has written over 1,400 pieces for you to study and his books are fabulous), and consider the “free program.” I did the free program for 3 months before my first tissue analysis. I proved to myself that I was all-in. As for your child, you must look deeply into yourself and ask if you are ready to be a leader in his life or a friend. I say this out of love because I know you fear discipline, the creativity it will require and the love it demands. This path is not easy, but neither is watching what you’ve allowed your precious child to eat destroy his health. Simply, by the time an issue reaches the skin level, it is serious. There are many other paths for the body to cleanse before resorting to skin. As for results, NB and functional med will come close in results; you will spend an enormous amount with functional med. I pay very little to have phenomenal, lasting, life-changing results that I control. I chose my mentor, I set my appointments with him, I order my supplements with his 20% discount, I grind my coffee beans and perform the enemas, I spent $100 bucks to make a world-class sauna system that I can use on my schedule for .18 energy over 24 hours of use, I grow some of my food and inexpensively purchase the rest at my “normal” grocery store, I bought a $40 juicer that is doing a fine job, I can give myself my own reflexology and I’m teaching myself the push down meditation that has focused my mind and calmed my nerves. . .can you imagine what this would cost from outside help? I’ve been blunt, but I think we live in a day where we need blunt and honest. We’ve been sold crap information, crap food, crap health “care.” It is time to take control or die. Your son is dying, and his grandparents and father have contributed–but blame is counter productive. It may be that you have to send his dinners pre-made. It may be that you have to show them my response and tell them that his health will be on their shoulders as the “adults” in his life. Or it may be that you explain the major hospital bills they will incur. . .bills that will addict him to drugs for the rest of his life. Your son has every reason to be in clean health. But he had better be disciplined now because his tastes and his will is growing in a very detrimental way. My best hope for you and all who are reading. It is a day for drastic measures because we are being killed. I cannot tell you how much I appreciate that you have taken the time to answer my question. I was listening to a podcast with dr. Wilson and started browsing the Internet and stumbled upon Wardees blog post. I have been following wardees work for over a year and have many of her books. It was like fate. I know I have to have a serious conversation with my hubby, parents and in laws. I have no idea where to start with my son. I have to toughen up, I know it. I just don’t know where to start. He won’t be able to eat fruit or any carbs right? I need to know what exactly he can eat. It’s going to be rough. I hope you have followed through with your son. Please give an update. NB saved my 22 year old daughter’s life, this year. I wish I had started all my children on this program early in life. Picky eating and junk food is a health disaster that runs epidemic in our country. Most may not know that low zinc and high copper may be one of the reason they are so picky. NB Practitioner for sure.100%. I’m on the program myself and I became a practitioner. (So maybe I’m biased, but Larry wilson explains about many functional medicine docs that still use the remedy approach. I believe him. He’s brilliant, but I digress…. )?This testing really does pinpoint the problems with mathematical precision. I really love being able to compare my new tests to the old ones…. big differences. I have many deep seated issues so I’m continuing to work on things. When I started pushing out all kinds of chronic infections, that was what really made me sit up and take notice. There is deep healing going on here…. I’m about to start a nutritional balancing program with the help of a accredited practitioner (Dr. L Wilson). I saw that one of your collaborators wrote an article about the program she followed herself for some time….The diet highly recommends cooking with a pressure cooker so I personally got the Instant pot (and have a slow cooker too). I looked around on the internet and failed to find recipes compatible with the program and its “allowed” ingredients. I’m interested in finding simple compliant recipes that will have a nice flavor and not be too bland. I’m not one to complain but savory meals is better for compliance and for any chance of my family to adhere to this new way of eating/life style. Do you have any pointers to recipes on your site or elsewhere that are compatible with a nutritional balancing program? So happy you are starting the program. It has done amazing things for my daughter and I am starting her two brothers. I don’t want you to be non-compliant with Wilson’s protocol, but I will tell you that you don’t have to do it perfectly. We never used a pressure cooker, my practitioner didn’t suggest it. We steamed, baked, or sauteed our vegetables and it worked great. I will say that after 6 months you can get really tired of vegetables, so changing the cooking method might help from time to time. Also, for the most part, she only took supplements two times a day. It made it more affordable to us and she had no detox symptoms until maybe 6 months in. Nice to know it worked for your family so far. Im aware that the detox symptoms will come at a certain point but did you at least get symptoms relief before that if that is not too much to ask? It also has a three week meal plan laid out. @Tami, I would like to spent $100 bucks to make a world-class sauna system! Can you share how to make this Sauna? ?